Suitable for ladies with a little experience learning how to belly dance anywhere else. At this class we focus on dance technique fun creative dance routines and performance art. There are social events for all to attend and optional performing arts for those who want to. Its a great opportunity to learn a hobby and be part of the larger belly dance community. So if you have had at least some lessons and you know some of the beginners moves of belly dance (camel undulation snake arms hip and chest accents & shimmies basic turn & three point turns and some traveling steps) and you wish to learn more at a challenging pace or just for a change of class feel free to come along to see if you like the class. Drop in classes mean you don't have to book or pay up front in advance. Just turn up & pay at class with cash. - Exercise & dance technique based suitable for women of all ages and abilities. We have a follow along dance towards the end of the class. Great for a workout & learning beginners technique. Just turn up. £5 per class. Social days and evenings for those who wish to attend. Cabaret Show - Dance student showcase with special guests. Professional & Ametuer performances. £5 per ticket - Tara's performing students free. £1 from every ticket sold goes to charity. All welcome. More details published as confirmed. 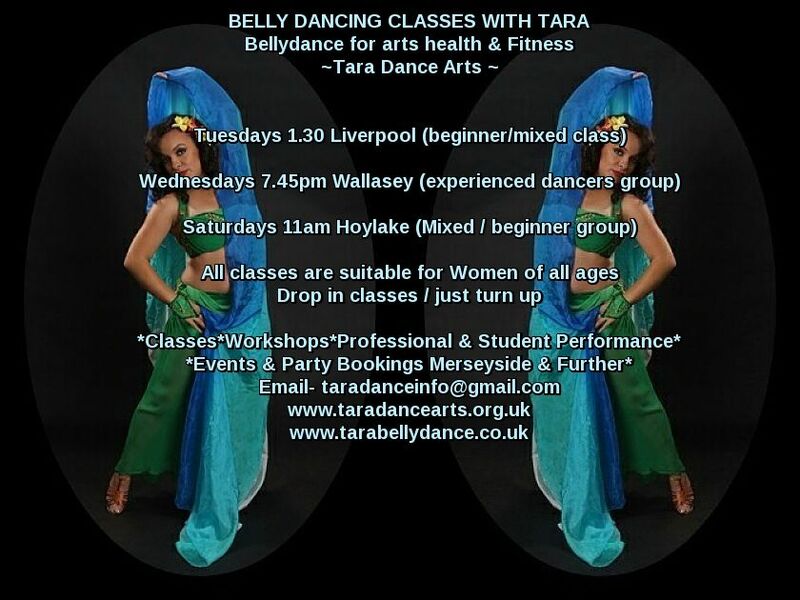 Details - The classes and workshops are organised and taught by Tara Maxwell an experienced professional belly dance performer, Makeup artist, Artistic director and teaching facilitator who holds full insurance, dance, fitness, Make up artistry first aid and teaching qualifications / certificates and is a professional member of Foundation for community dance. The classes have been featured on TV Radio and printed publications. 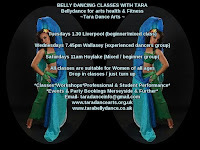 Tara is employed to teach at the women's charity WHISC in Liverpool city centre and has ran her dance school "Tara Dance Arts" since 2013.